Recover Faster. Recover Better. Come Back Stronger. It is quite unusual in commercial development when a new product is deemed a major breakthrough and at the same time, advances our understanding of science. 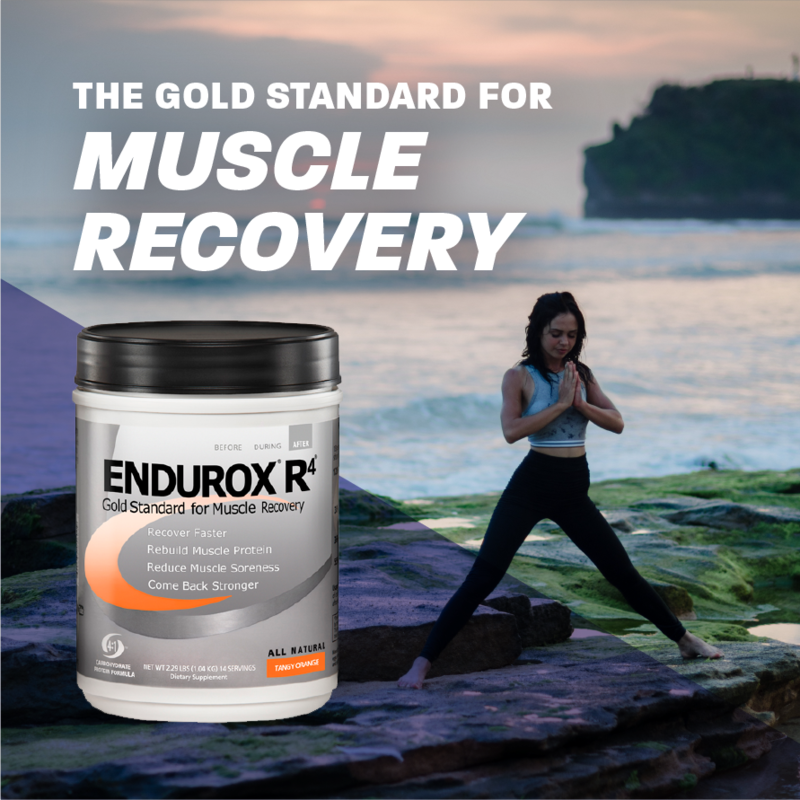 Endurox R4 created the recovery category and multiple studies conducted using Endurox R4 gave scientists enormous insight on the mechanisms underlying muscle recovery. Every ingredient in Endurox R4 was specifically added to maximize recovery. It was the first product to show that a 4:1 ratio of carbohydrate to protein could accelerate recovery and raise the training level. Studies have reported a 55% increase in endurance in a subsequent workout 16 hours later and a 14% increase in muscle function 24 hours later. 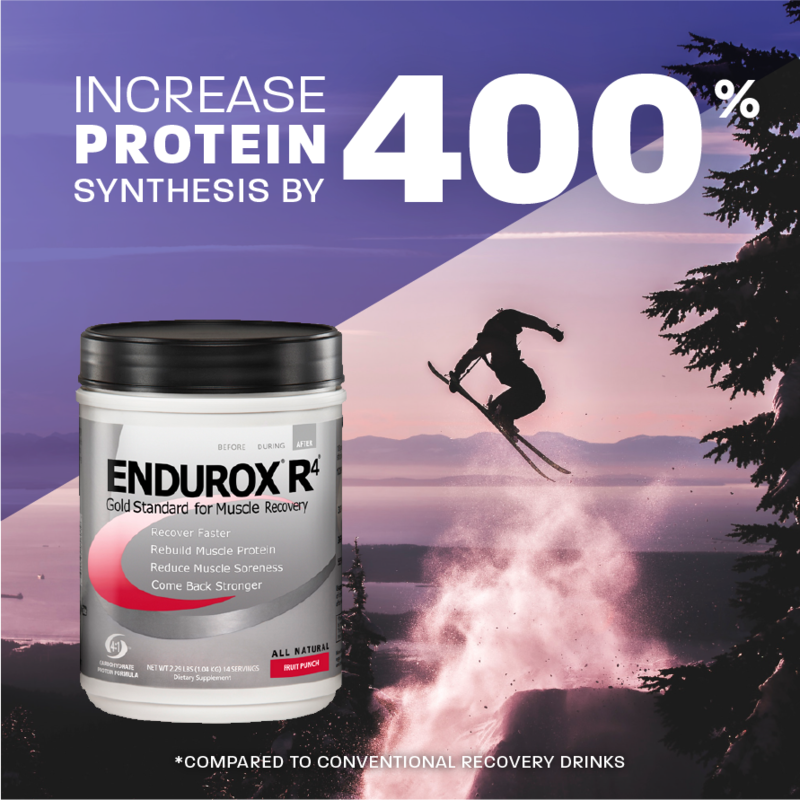 Compared to a carbohydrate-only recovery beverage, Endurox R4 increases post-exercise protein synthesis or muscle repair, by 400%. What many athletes find surprising is that Endurox R4 actually increases protein synthesis 37% greater than a protein drink. The carb-protein combination activates multiple pathways for turning on protein synthesis, whereas a protein drink primarily activates a single pathway. The combination of rapid-acting carbohydrates contained in Endurox R4 ensures fast absorption and transport to muscle cell within the 45-minute recovery window. The addition of glutamine to Endurox R4 helps replenish the muscle cell’s number one amino acid and the unique combination of antioxidants neutralizes free radical formation that occur as a natural consequence of exercise and are a major cause of muscle soreness. 1. Effects of Recovery Beverages on Glycogen Restoration and Endurance Exercise Performance: Williams MB, Raven PB, Fogt DL, Ivy JL. Journal of Strength and Conditioning Research. 17:12-19, 2003. This study determined that "The rate of [post-exercise] recovery is coupled with the rate of muscle glycogen replenishment," and that "recovery supplements should be consumed to optimize muscle glycogen synthesis as well as fluid replacement." Eight endurance trained cyclists performed two trials consisting of a 2-hour glycogen depletion ride followed by an exhaustive ride at high intensity. Subjects received either a carb-protein beverage (Endurox R4) or a carb-only sports drink immediately and 2 hours post-exercise. Post-exercise ingestion of carb-protein beverage (Endurox R4), in comparison to the carb-only beverage, resulted in a 55% greater time to exhaustion during a subsequent exercise bout at 85% VO2max. Ingestion of the carb-protein beverage resulted in a 17% greater plasma glucose response, a 92% greater insulin response and a 128% greater storage of muscle glycogen compared to the carb-only beverage. 2. Effects of Recovery Drinks After Prolonged Glycogen-Depletion Exercise: Williams MJ, Ivy JL, Raven PB. Medicine & Science in Sports and Exercise. 31(5):S124, 1999. 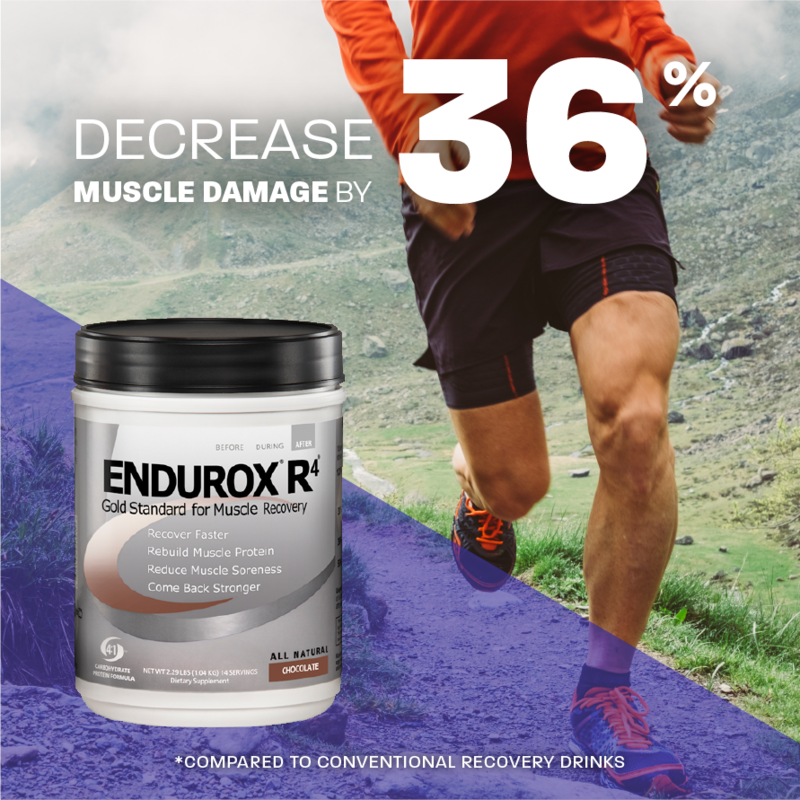 This study found that "recovery from glycogen-depleting exercise was significantly enhanced by [Endurox R4] Recovery Drink when compared to Gatorade. In addition, [Endurox R4] Recovery Drink decreased the formation of final oxidation products, when compared to Gatorade." Eight male cyclists performed a two-hour cycling exercise bout followed by one to three 5-minute sprints. A four-hour recovery period ensued in which the subjects were given 24 ounces of either Endurox R4 or Gatorade. A performance test to exhaustion was then conducted. The recovery phase showed significant increases in both plasma glucose and insulin following Endurox R4 ingestion as compared to Gatorade. There was an average 66% increase in time to exhaustion during the performance ride following Endurox R4 ingestion compared to Gatorade. Final oxidation products following Endurox R4 ingestion were significantly decreased as compared to Gatorade ingestion. 3. The Effect of Two Sports Drink Formulations on Muscle Stress and Performance: Ready SL, Seifert JG, Burke E. Medicine & Science in Sports and Exercise. 31(5):S119, 1999. This study demonstrated that "A [carb-protein supplement], by providing additional [carbohydrate] and amino acids, may reduce postexercise muscle stress, as evidenced by a 36% decrease in 24-hour [creatine kinase] levels. Ten college-age males and females completed a 45-minute run, rested in a 10-minute transition, cycled for 90 minutes, and then performed a time trial (TT). During the transition and 30 minutes into the bike segment, subjects ingested either a 15% carb-protein beverage (Endurox R4) or a carb-only beverage.. Blood samples were collected and analyzed for creatine kinase (a biomarker of muscle damage), lactic acid and glucose. There was a 36% reduction for the 24-hour post-exercise creatine kinase level in the carb-protein treatment. 4. Effects of Post Exercise Carbohydrate-Protein Supplement on Skeletal Muscle Glycogen Storage, Fogt DL, Ivy JL. Medicine & Science in Sports and Exercise. 32(5):S60, 2000. This study showed that "The greater rate of recovery following glycogen-depleting exercise during the [carb-protein] treatment shown [in previous studies] was likely due to a greater glycogen restoration." 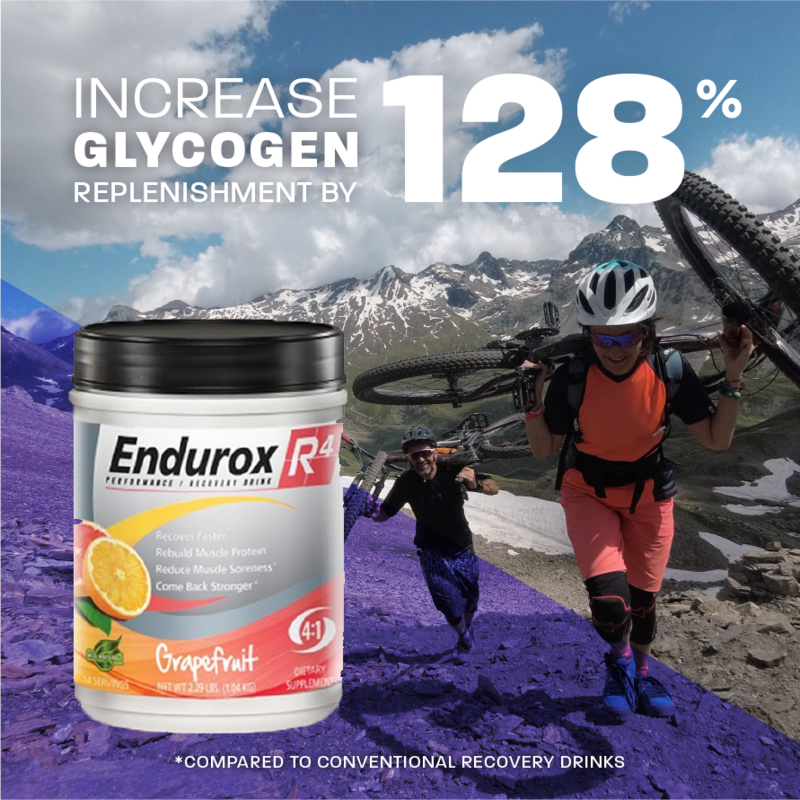 Eight endurance-trained cyclists performed two trials consisting of a 2-hour glycogen depletion ride followed by ingestion of 12 oz of a carb-protein supplement (Endurox R4) or a carbohydrate supplement immediately and 2 hours post-exercise. Trials were randomized and separated by 7 days. Blood samples were collected prior to exercise and throughout the 4-hour post-exercise recovery period. Muscle biopsies were taken immediately after and 4 hours postexercise for determination of muscle glycogen content. Ingestion of the carb-protein supplement resulted in a 17% greater plasma glucose response, a 92% greater insulin response, and a 128% greater storage of muscle glycogen compared to the carb-only supplement. 5. Carbohydrate Protein Complex Increases the Rate of Muscle Glycogen Storage After Exercise, Zawadzki KM , Yaspelkis BB,Ivy JL. Journal of Applied Physiology. 72:1854-1859, 1992. This study found that "post-exercise muscle glycogen storage can be enhanced with a carbohydrate-protein supplement as a result of the interaction of carbohydrate and protein on insulin secretion." Nine men cycled for two hours on three occasions to deplete their muscle glycogen. After each workout they drank a carbohydrate, protein, or carb-protein supplement. The rate of muscle glycogen replenishment in the carbohydrate-protein treatment was 38% greater than in the carbohydrate treatment and more than three times greater than in the protein treatment. 6. Carbohydrate-Protein Drink Improves Time to Exhaustion After Recovery From Endurance Exercise, Niles ES, Lachowetz T, Garfi J, Sullivan W, Smith JC, Leyh BP, Headley SA. Journal of Exercise Physiology Online. 4:45-52, 2001. This study demonstrated that "a [carb-protein] drink following glycogen depleting exercise may facilitate a greater rate of muscle glycogen resynthesis than a [carbohydrate-]only beverage, hasten the recovery process, and improve exercise endurance during a second bout of exercise performed on the same day." Ten male athletes completed a long workout on stationary bikes, then drank either a carb-protein sports drink (Endurox R4) or a carb-only sports drink. After a two-hour rest the subjects completed an endurance bout to exhaustion. The athletes went 20% longer with the carb-protein sports drink than with the carb-only sports drink. 7. Early Post Exercise Muscle Glycogen Recovery is Enhanced with a Carbohydrate-Protein Supplement, Ivy JL, Goforth HW Jr, Damon BM, McCauley TR, Parsons EC, Price TB. Journal of Applied Physiology. 93: 1337-1344, 2002. This study showed that "a [carb-protein] supplement is more effective for the rapid replenishment of muscle glycogen after exercise than a [carb-only] supplement of equal [carbohydrate] or caloric content." Subjects completed a very long workout on stationary bikes and then drank either a carb-protein sports drink (Endurox R4) or a carb-only sports drink of equal calories. Four hours later, muscle glycogen was significantly greater in those given the carb-protein sports drink. 8. Post Exercise Protein Intake Enhances Whole-Body and Leg Protein Accretion in Humans: Levenhagen, DK, Carr C, Carlson MG. Medicine and Science in Sports and Exercise. 34: 828-837, 2002. This study found that post-exercise consumption of a carbohydrate-protein supplement increased protein synthesis in exercised muscles and throughout the body compared to a carb-only supplement and placebo. Five men and five women completed a one-hour stationary bicycle ride. Upon completion of the workout, subjects were randomly given either the placebo, the carb-only supplement, or the carb-protein supplement. The test was repeated until all subjects had received all three treatments. The carb-protein supplement increased plasma essential amino acids 33%, leg uptake of glucose 3.5-fold, and leg and whole-body protein synthesis 6-fold and 15%, respectively. Whereas post-exercise intake of either placebo or the carb-only supplement resulted in a net leg release of essential amino acids and net loss of whole-body and leg protein, the carb-protein supplement resulted in a net leg uptake of essential amino acids and net whole-body and leg protein gain. 9. Effect of an Isocaloric Carbohydrate Protein Antioxidant Drink on Cycling Performance, Romano-Ely BC, Todd MK, Saunders MJ, Laurent TS. Medicine & Science in Sports & Exercise. 38 (9): 1608-1616, 2006. I love Endurox R4. Since I am using it my recovery is a piece of cake. Either after a hard track workout or a long run I have no problem waking up the next day. Body is rested and muscle fully recovered. Endurox R4 is honestly the best and cleanest recovery drinks out there. I have been using it for years. It still amazing me, no matter how tough of a workout I do it will help me get ready for the next one. If you haven't already tried it do yourself a favor and give it a try. My son started using Endurox R4 this year after every Cross Country / Track & Field practice and he's really seen a difference in the recovery process. I'm so happy his coach recommended this product to us! 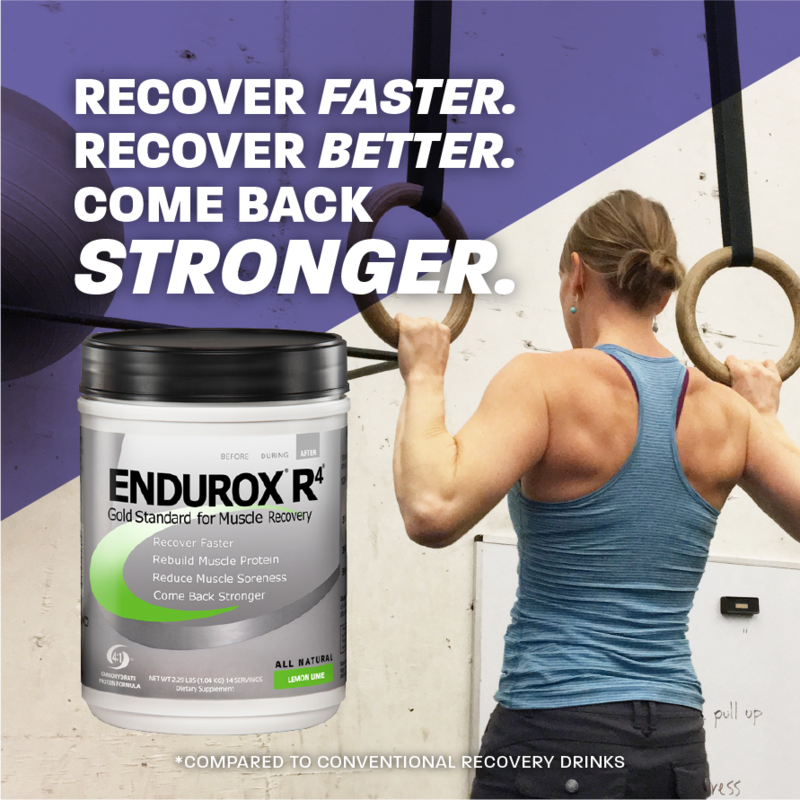 Been using various recovery nutrition supplements for years but decided to try Endurox R4 (with free shipping through the endurance club!) 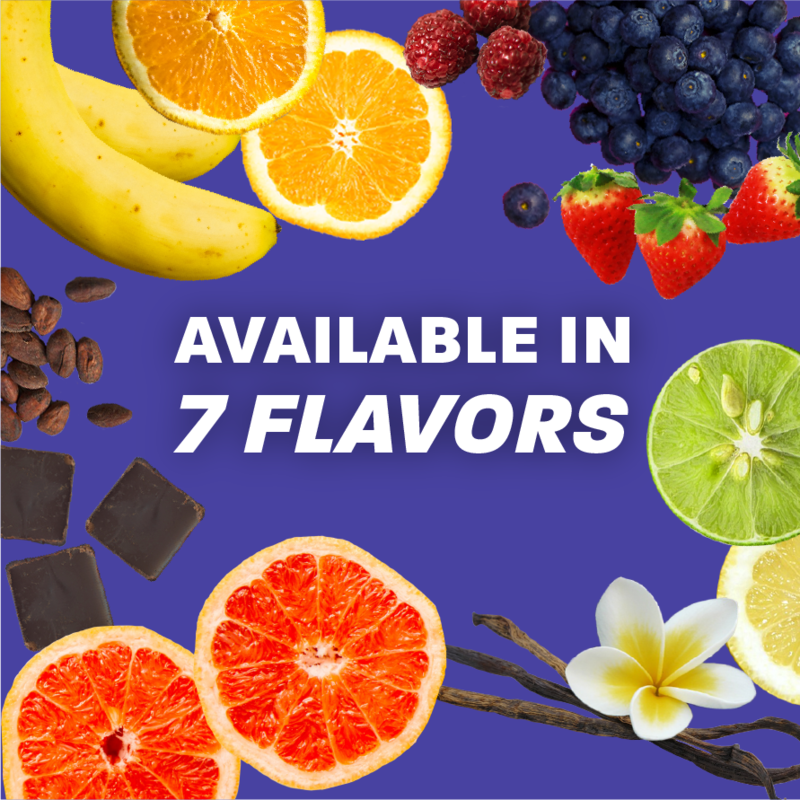 and it's the best tasting/working product on the market! Thank you for the free stuff PacificHealth! I love Endurox R4. I've been using it for more than a year and it really helps me recover quickly from a strong workout. I love the taste and I always tell my friends and running group to get this! I love this product! I find myself working out that much harder because i crave the tangy orange flavor so much. The gains in strength n muscle are awesome. I really come back stronger everyday i hit the gym!